產品介紹: M-H培養基（Mueller-Hinton Broth）是一種微生物培養基，應用於檢測微生物對於抗生素的抗性。此外，這種培養基還可用於篩選奈瑟氏菌屬（Neisseria）以及Moraxella屬的物種。由於該培養基的一些特性，使它有利於應用在抗生素檢測上。首先，它是一種無選擇性培養基，大部分的微生物都可在上面生長。此外，成分中的澱粉可以吸收細菌所釋放出來的毒素，因此不會影響抗生素操作的結果。M-H培養基的成分較為疏鬆，利於抗生素的擴散，使其可以顯現明顯的生長抑制帶（zone of inhibition）。This medium is the broth version of Mueller Hinton Agar. It is an antagonist free medium for use in the tube dilution technique for the determination of antibiotic M.I.C. values. The medium is carefully standardised to meet N.C.C.L.S. 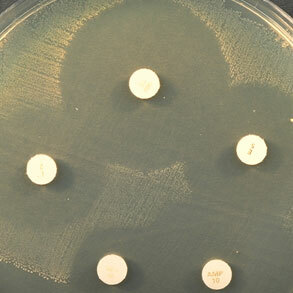 standards for antimicrobial susceptibility tests on bacteria which grow aerobically.